Available wherever books are sold. Available at Amazon. Gail Harris is an author, and was finalist of an IPNE Book Award for the memoir Finding Zoe. Her focus is writing books for others, particularly self-help and memoirs. She also provides manuscript evaluations. A story-teller at heart, Gail began telling her clients’ stories as an award-winning advertising copywriter. Shifting focus, she wrote Your Heart Knows the Answer, which teaches us how to listen for and then trust our intuition by learning how to distinguish it from our intellect and emotions. 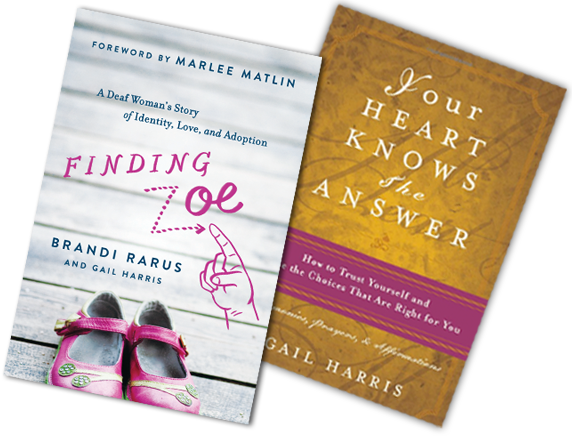 Her next book, Finding Zoe, whose Foreword was written by Academy-Award-Winner Marlee Matlin, is her co-author’s memoir, a former Miss Deaf America named Brandi Rarus. Through Brandi’s journey to find self-acceptance and then adopt her deaf daughter, the book explores the themes of finding our place in the world and fitting in, being judged and judging others, and moving past them to realize our dreams. Gail is also a contributing author in Unwavering Strength: Volume II. Stories To Warm our Heart and Soul. Her White Bread Wisdom Blog, conceived from an “aha” moment with her son, shares her thoughts on parenting and adoption and importance of connecting with Spirit. Gail is a featured contributor for several parenting and self-empowerment magazines and blogs and is the mother of a thirteen-year-old boy. Please check out Gail’s resources for moms, people touched by adoption, and those that support you in nurturing yourself.